Dosa is a type of pancake from the Indian subcontinent, made from a fermented batter. It is somewhat similar to a crepe in appearance. Its main ingredients are rice and black gram. Dosa is a typical part of the South Indian diet and popular all over the Indian subcontinent. Traditionally, Dosa is served hot along with sambar, stuffing of potatoes or and chutney. 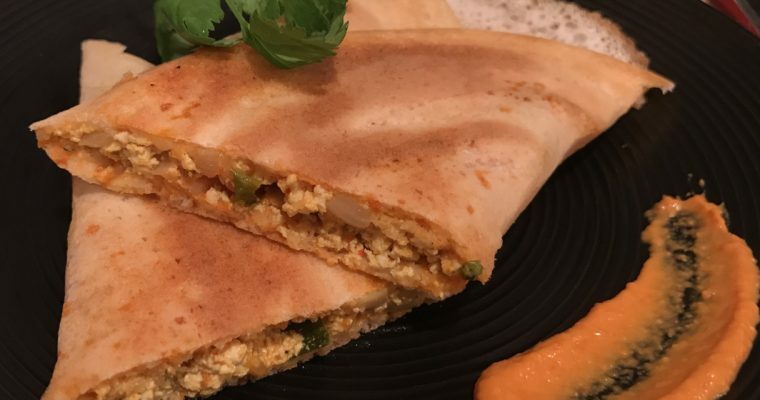 But if you are looking for something new or need some change to your regular masala dosa then Tofu bhurji masala dosa is perfect for you and healthier then eating regular dosa. 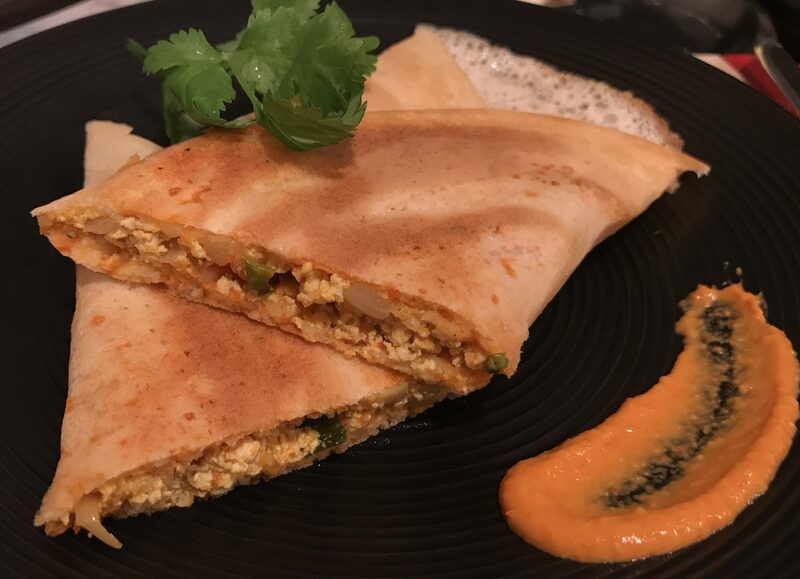 For creating this recipe I will give credit to the available ingredients in my fridge specially dosa batter and tofu 😉 . I have used brown rice to make dosa batter in this recipe and it was great. 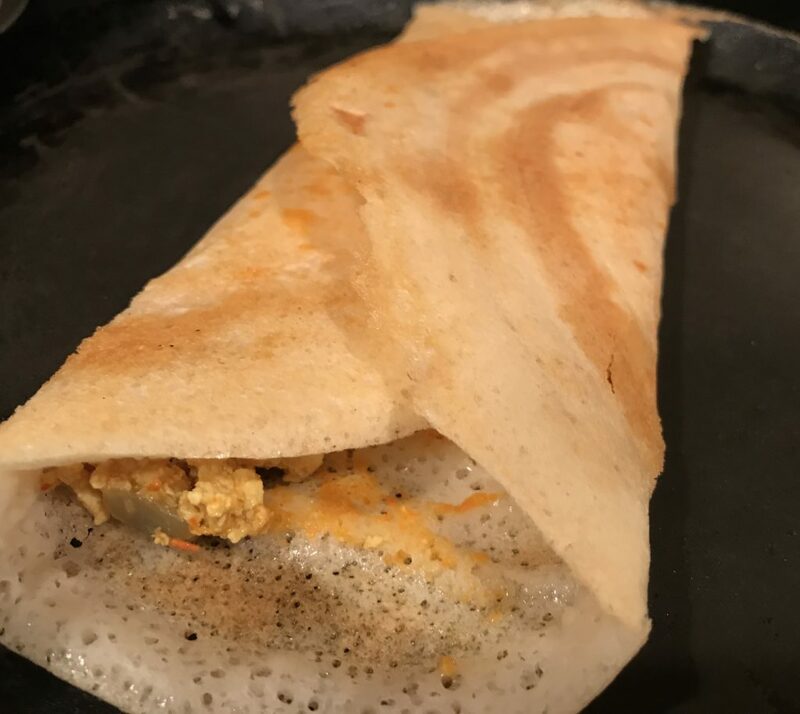 This recipe is a low calorie version of traditional masala dosa which is gluten free, vegan and time saver. If you are allergic to gluten then this will make best wrap for you. No need to cook potatoes or no need to make sambhar (lentil soup) along with it. Serve this wraps along with chutney or ketchup or any dip of your choice. 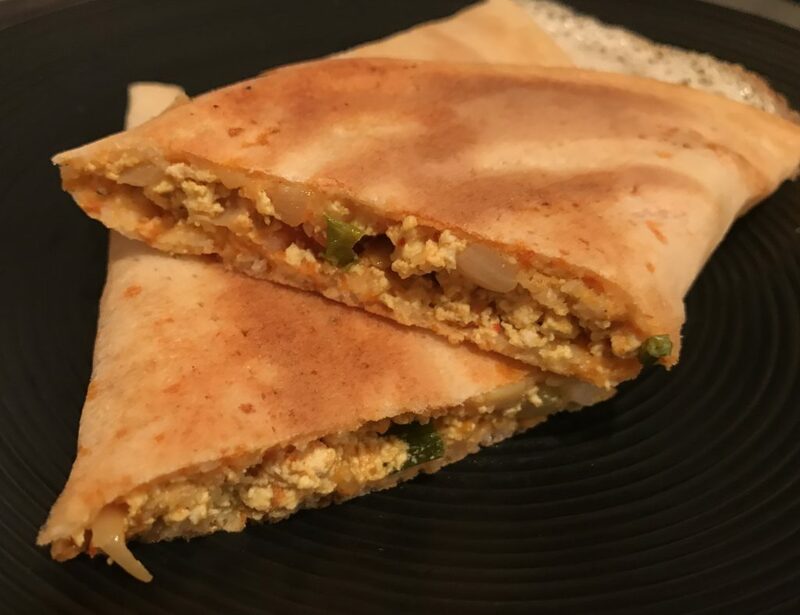 Crispy wrap is filled with scrambled tofu which is seasoned with indian spices. Heat a pan on medium heat. Add oil into it. Add finely chopped onion and sauté it for 2-3 mins or till it turns translucent. Add tomatoes and ginger garlic paste and sauce it for 2-3 more mins. Add all the spices along with salt and mix it well. Crush dried fenugreek leaves ( kasuri methi ) in your palm and add it into the prepared stuffing. 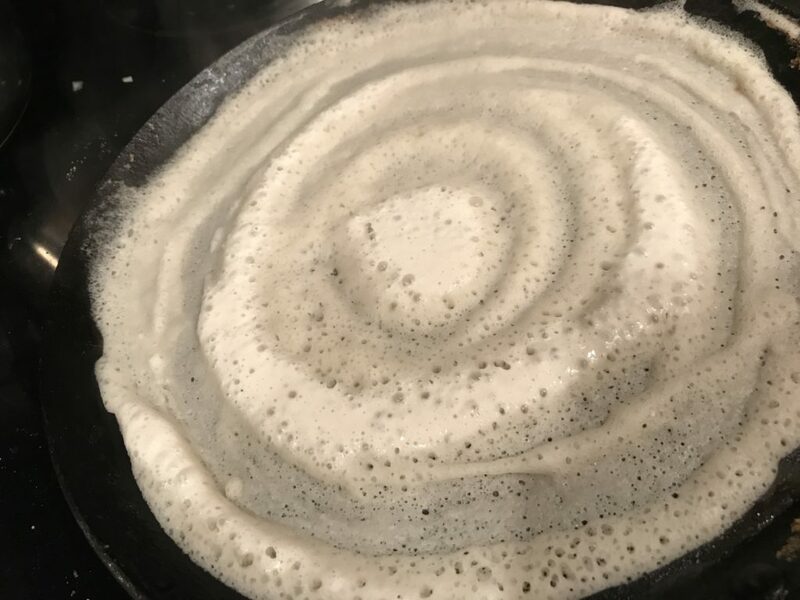 You need ready dosa batter, Take a dosa pan or flat nonstick pan / crepe pan. coat pan with an oil and spread batter on medium heated tawa or pan in a circular motion. Add oil or butter to make it crispy. Apply maisur masala dosa chutney which is optional but taste enhancer. You can apply any spread available like garlic chutney or cheese spread or tomato ketchup. 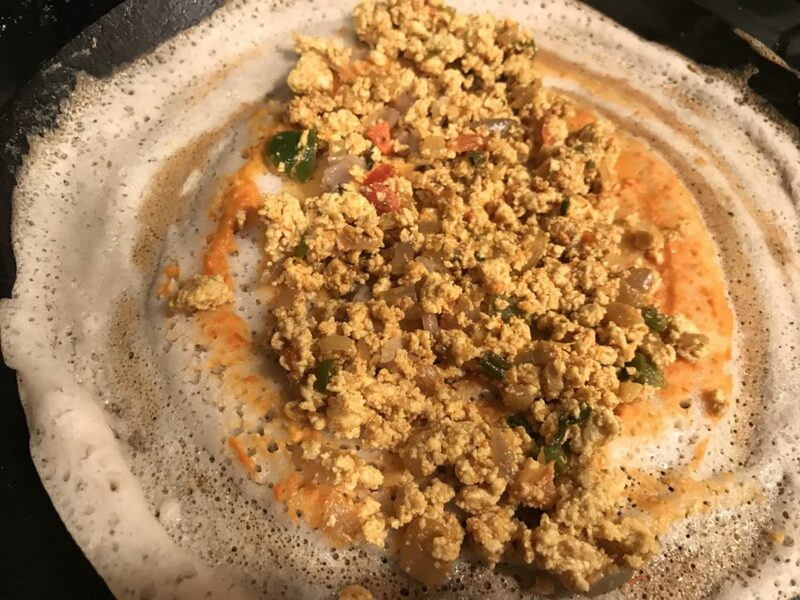 After that add prepared tofu stuffing in the center and fold dosa from both sides once it is light brown in color. Serve it hot with maisur masala chutney or any of your favorite condiments and you will love this version. If tofu is not available then you can use paneer instead of tofu. Soak all the ingredients separately for 10-12 hrs or overnight except poha. soak poha for ½ hr. Grind it into the grinder till thick smooth texture. Ferment it for 8-10 hrs and then you can store this batter in an airtight glass container for 3-4 day. Do try it and don’t forget to share it with your friends and family. Tofu is a good source of protein and contains all eight essential amino acids. It is also an excellent source of iron and calcium and the minerals manganese, selenium and phosphorous. In addition, tofu is a good source of magnesium, copper, zinc and vitamin B1. Tofu is an excellent food from a nutritional and health perspective. It is thought to provide the same sort of protection against cancer and heart disease as soya beans. Tofu and all soya products contain large amounts of oxalate. Individuals with a history of oxalate containing kidney stones should avoid over consuming soya products. 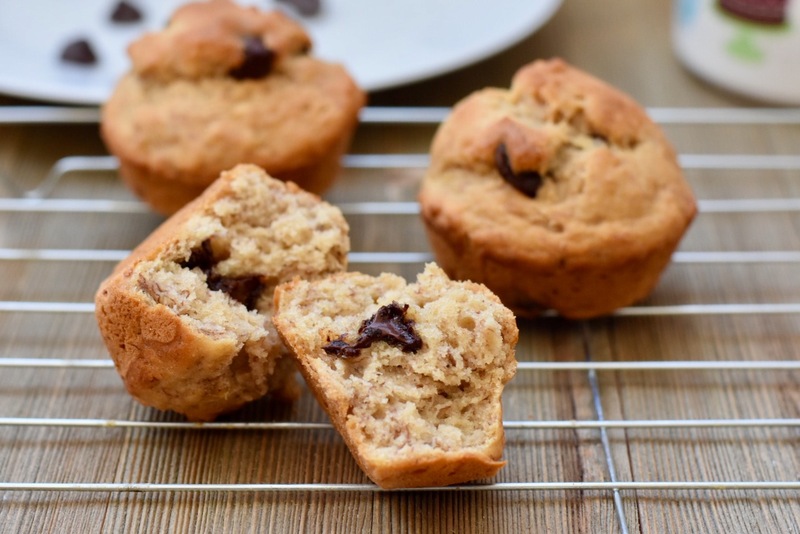 Women who have or have had oestrogen-sensitive breast tumours should restrict their soya intake to no more than four servings per week. For more details regarding Tofu check here. Change the way you cook!